Lovely two bedroom, two bath condo at desirable Waverly Park Resort. This beautifully decorated condo is full of amenities and upgrades. Two bedroom suites are furnished with king in master suite and queen in guest suite, cable TV and two on-suites. This is a charming, well maintained condo with updated kitchen and all the amenities of home. Private patio with BBQ and seating. 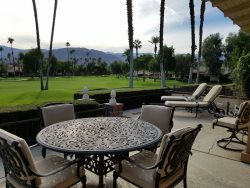 Located close to down town Palm Springs and surrounding cities, dinning, shopping and desert attractions yet nestled in a quite beautifully landscaped gated resort with sparkling swimming pools, spas, tennis, pickle ball and paddle tennis courts.